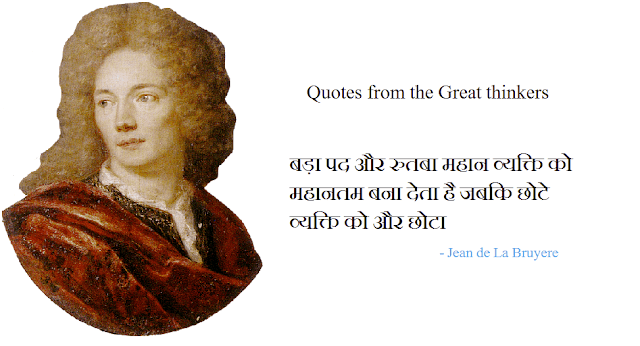 Popular Bruyere quotes in Hindi - The great Philosopher Bruyere was born in Paris in a middle class family. He was very popular for Vyangapurana writing and characters. They Became a royal tutor after his Law studies. His writings were considered as masterpiece in French Literature. So today I have made a collection of the beautiful and motivational quotes by Bruyere. Don't forget to share this beautiful collection of realistic Hindi quotes on Facebook and other social media. Do log kabhi lambe samay tak dost nahi rah sakte agar ve ek dusre ki choti galtiyo ko maaf nahi karte. दो लोग कभी लंबे समय तक दोस्त नहीं रह सकते अगर वे एक दूसरे की छोटी गलतियों को माफ नहीं करते. Kuch mamlo me samanaya aur madhayam darje ki cheeje kabhi nahi rahti jaise- Kavita, Sangeet, Painting aur Public Speaking. Insaan ke jeevan me teen ghatnaye hoti hai- Janam, Jeevan aur Maut. Apne janam ka use pata nahi chalta, dard me uski Maut hoti hai, Aur Jeena kaise hai ye use pata nahi hota. Tarak karne ki Kshamata hi humari dharnao ko pukhta banati hai, aur humari dharnao ko pukhta karne ka yahi ek tarika hai. So this was the collection for best real life quotes in Hindi, hope you read and enjoyed them all. We will be updating this collection and don't forget to read our other collection at Hindi Status. And share it with your friends and followers.